We are all in need of conversion. My colleague Pedro mentioned previously in his blog and the weekly edition of Perspectives on Christian Unity (and they talked about this on the show). Hearing the phrase "we are all in need of conversion," I recall the story of how Brother André begged those around him to pray for his conversion. This request always baffled me. Why would a saint pray for conversion? I understand now it was his humility and self-awareness that motivated him to make the request. We certainly are in need of conversion -- of turning away from sin, and turning to God (after all, sin is turning our back to God). On Tuesday, January 25th, we celebrate the feast of the conversion of St. Paul. It's a significant event to mark. 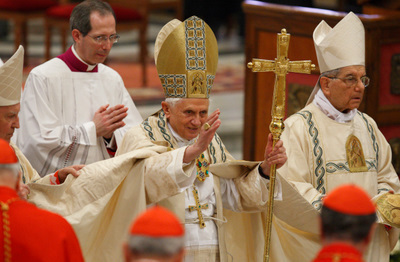 As Pope Benedict said on last year's feast, it "became the beginning of [Paul's] tireless missionary activity. In this he was to spend every ounce of his energy, proclaiming to all the peoples the Christ whom he had met personally." It also marks the conclusion of the Week of Prayer for Christian Unity, or perhaps accurately the Octave of Prayer for Christian Unity, which began on Tuesday, January 18th. (It's interesting to note that Eastern Orthodox, Anglican and Lutheran churches celebrate January 18th as the feast of the Confession of St. Peter, where Peter acknowledges Jesus at the Messiah (Matthew 16:13-20)). To mark the feast, and the conclusion of the week of prayer, Pope Benedict XVI will one again preside over Vespers at St. Paul Outside the Walls. Each one of us is called to make his or her contribution towards the completion of those steps that lead to full communion among the disciples of Christ, without ever forgetting that this unity is above all a gift from God to be constantly invoked. In fact, the force that supports both unity and the mission flows from the fruitful encounter with the Risen One, just as was the case for St Paul on the road to Damascus, and for the Eleven and the other disciples gathered at Jerusalem. Vespers on the feast of the Conversion of St. Paul will be broadcast live on Salt + Light with English translation, Tuesday, January 25th at 11:30 ET, with an encore presentation at 8:00pm ET / 9:00pm PT. CNS photo/Paul Haring: Pope Benedict XVI waves after celebrating vespers closing the Week of Prayer for Christian Unity at the Basilica of St. Paul Outside the Walls in Rome on January 25th, 2010.